** Hotel / Houseboats on Twin sharing Basis. ** All transfer and sightseeing by 01 Non A/C Qualis/Tavera. ** All present applicable taxes as on date. After breakfast at the hotel, we will begin our day journey towards Pahalgam. The route traverses through the picturesque mountain resort of Patnitop. From Patnitop we will drive to Ramban that also serves as our next stop for lunch. From Ramban we will drive to Banihal and enter the 2.5 kilometer long Jawahar tunnel that connects the valley of Kashmir with the rest of India. We will emerge from the other side to a warm sunny afternoon and continue our drive towards Pahalgam. On arrival in Pahalgam, we will check in at the hotel and stay there for the night. Dinner and overnight in hotel. Today we will do some half a day of local sightseeing that includes a visit to the famous Mughal gardens of Nishat and Shalimar. Built in between a period of 14 years the two gardens are a heritage left behind by the erstwhile Mughals, whose taste for laying exquisite gardens was fascinating. With a backdrop of the sprawling Zabarwanmountains, the gardens boast of green turfs, blooming flowers and cascading water fountains. We will explore the gardens and later drive back to the hotel / houseboat for a inner and Overnight stay. After a late morning breakfast, we will drive to the airport for your flight home. At the airport the driver will assist you with your luggage screening and drop you at outside the terminal gate. Honeymoon couple to enjoy their married life on the serene waters in Houseboats or under the soothing shades of Mighty Chinar Trees. The gateway of Kashmir, the winter capital elevation 300mts lies at the foot of Himalayan region of Kashmir.This city has a long been a center of Indian pilgrimage Dogra culture, temple city. Majority of Hindus with small Muslim communities around Banihal and Kishtwar south of the Kashmir valley, around Poonch and the border. Population one million, majority of Muslims. The quaint charm of Houseboats of Dal Lake, Nageen Lake and Naseem Lake in Srinagar to stay is a MUST .The Houseboats are having two Bed rooms, three bed rooms and four bed rooms with attached bath, with dining and Sitting room also with Sun-deck. Each houseboat is having the attendant who can also serve the food. Explore lapping journeys on a Shikara in the lakes, past floating gardens. 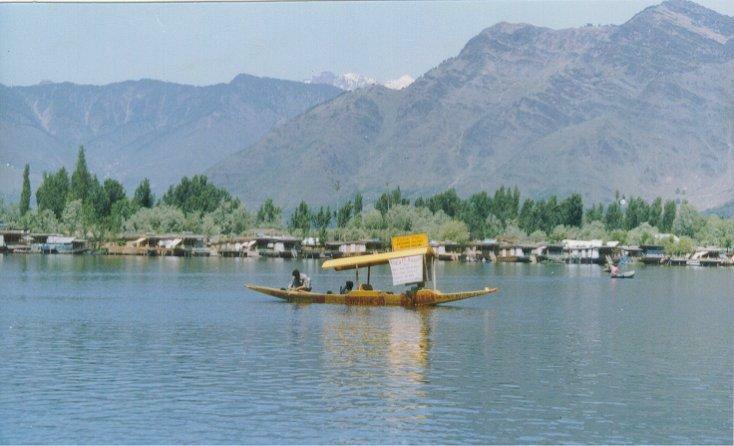 Houseboat were introduced accidentally in Kashmir. Most of British Civil and Military officers serving in the plains used to come to Kashmir with their families for holidays. They wanted to built houses for themselves but the Maharaja (King) of Kashmir of that time was suspicious of their designs and did not allow them to buy land, so they built the first Houseboat- named Victory designed by Mr M T Kenhard in 1888. Later other copied this design and now there are about 500 Houseboats in Srinagar for commercial purpose . Pahalgam: 95 km. east of Srinagar, 2400 mts above sea level. Popular holiday resort. It is called â€œShepherds villageâ€ at the head of the Lidder valley. Best place for trout fishing. Apart from angling , Pahalgam is also known as the starting point for trekking. Pilgrims route to Amarnath Cave. Accommodation: Good Hotels / lodges and Tourist Bung lows. Three hours journey by road from Srinagar, can be covered by Deluxe buses. Taxi can also be hired for the day trip basis . Gulmarg: 56 kms from Srinagar, one and a half hour journey, 2690 mts above sea level. .It is called â€œMeadow of flowersâ€. 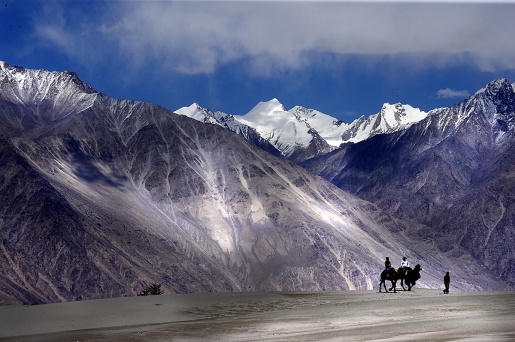 In summer best for trekking, golfing and pony rides . One can have beautiful walk around and can see in good weather the high mountains like Naga Parbat (In Gilgit) 7650mts high, Kolohi and Harmukh which are 5425 and 5124 mts high.Gulmarg has the worldâ€™s highest green golf course in the world. There are cable cons that ferry the tourists up to the height of 3095 mts. (Gondola). Accommodation: Plenty of hotels/Huts/lodges with reasonable prices. Taxis and Deluxe buses are running from Srinagar. Yusmarg: 50 kms southeast of Srinagar, one and half hour journey through pine and fir forests. On the way to Yusmarg is the shrine of famous Kashmiri sufi saint : Sheikh Noor-ud-din, popularly known as Nunda Rishi. One can go up to Nilnag Lake either by foot or on a pony back. There is Tourist huts available. Sonmarg: 87 km. from Srinagar, 3 hours journey, 2800mts above sea level. It is called Golden meadowâ€ at the head of the river Sind with beautiful mountains and glaciers. Base for the treks to Harmukh range via Nichnai, Vishensar Lake, Gangabal and to Nara Nag . Also the Pilgrim route to Amarnath Cave , which can be done in one day from here. Famous for Trout fishing. Accommodation: Few Hotels/ Huts and Lodges . Taxis and Deluxe buses are running from Srinagar. Nishat Bagh: The Garden of bliss laid down by Asif Khan father of Empress Noorjahan in 1633AD on the bank of Dal Lake with Zabarvan Massif at the back. In Nishat commands magnificent view of the Lake and the Snow capped Pir Panchal Range to the west of the valley. Shalimar Bagh: The Abode Of Love.â€™ Is said to have been a village, built by Paravarassna II. He used to stay here when on a visit to Sukhswami a saint living near Harwan. In 1619 Jehangir ordered a garden to be laid out this spot, calling it, Ferrah Bakkash (Delightful). In 1727 A.D Zaffar-Khan. A governor during the reign of Shah Jahan made an extension of it and called it â€˜Faiz Bakshâ€™ (Bountiful). The garden is laid down in four terraces, rising one above the other. A canal runs through the garden lined with polished stones and supplies with water from Harwan.Chasma â€“ Shahi : East of Srinagar. Built in 1634 A.D by Shah- Jahan. It commands a superb view of the Dal Lake it has the advantage of having a natural spring of Pure, Cool and Sparking water known as Chasma- Shahi (Royal Spring). Harwan Garden: Harwan Garden is a beautiful garden, situated at Harwan, about 18 km from Srinagar, in Jammu and Kashmir. This huge garden lined with flower beds and Chinar trees, is an ideal spot for picnickers. The picturesque Harwan Lake is behind the garden. The canal flowing through the middle of the garden is fed by the lake. Cheshma Shahi: Cheshma Shahi is one of the three major Mughal Gardens in Srinagar. It is located 9km from Srinagar city centre, and is the first Mughal garden that you would visit as you pass the Nehru Park. The name Cheshma Shahi means Royal Spring (shahi means royal and chashma means spring). Cheshma Shahi is small and charming. It was laid out by the Mughal Governor Ali Mardan Khan for Emperor Shah Jahan, the ruler famous for building the Taj Mahal, in 1632. Shah Jahan built a pavilion and laid out the Mughal garden in three terraces, each above the other by 18 feet. Cheshma Shahi is famous for the pure and refreshing spring that flows from it. Built at a height above the city, Cheshma Shahi offers a great view of the surrounding area with the Zabarwan hills behind it. Parimahal ( The palace of Fairies): It was a school of Astrology built by Dhara Shikua, Shah Jahanâ€™s eldest son for his tutor Muhlah Shah. School of observatory. Hari Parbat: The Hill of Hari Parbat crowned by the pathan fort who his visible from every part of the city. 400 feet above the plain, Legend says the hill grew from a pebble dropped by the goddess Paravati to crush a demon, in the form of Sharika bird (Maina). This is called now Hari Parbat. Shankaracharya Temple: This Temple is situated at the height of 1000ft above the plain. The earliest of all the Temples built in 200 BC,. By Jalaka the son of the Great Buddhist convert Ashoka. The temple was subsequently rebuilt and dedicated by Raja Gopadittya in 6th Century. It is said to be that â€œ the Takhut-I-Sulaiman (throne one of the Solomon). Panoramic view of whole Srinagar City . Hazratbal: It is the most important Muslim Religious place, situated on the western shore of Dal Lake. Jamia Masjid: The largest Masque built by Sultan Sikandar Constructed in 1400 A.D. Enlarged by his son Zain-Ul- Abdin. Tomb of Zain-Ul-Abidin: The most attractive chapter of Muslim rule in Kashmir (1421-1472) in the reign of Zain- Ul-Abdin. Pather Masjid: Pather Masjid of the Mughal Mosque built by emperor Noor Jahan in 1620 A.D. wife of Jahangir. Muslims did not however use it for prayers. Shah Hamdan: Originally built in 1953 AD. To commemorate the visit of Mir Syed Ali Hamdan destroyed by fire in 1479 and 1731 AD. It was rebuilt in 1732 by Abdul Barket Khan and since then stand as a land mark in the City. Built of timber, not a nail or Screw was used in the construction. 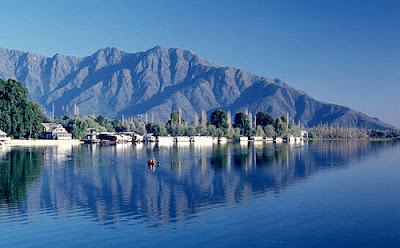 Dal Lake: Dal lake of Kashmir is one of the most beautiful and picturesque lakes in India. It has been and continues to be a part of the poetry by some renowned poets. This is second largest lake of Jammu and Kashmir state after Wular Lake. The lake is surrounded by majestic mountains from three sides and a large number of gardens and orchards have been laid along the shores. The University of Kashmir also stands along the shores of the Dal Lake. The hundreds of uniquely decorated houseboats which floats on the Dal lake afford an opportunity to tourists to reside on the lake in an atmosphere of peace and tranquility.